The Canoe Yawl 400 is sailed from the cockpit seat, like a large sailboat. You don’t need to hang over the weather rail to keep her upright, and she is surprisingly close-winded for a boat with a low old-fashioned rig. In spite of three sails and a centerboard to work, she is easily handled for a single sailor – with a company on board nobody needs to sit passively. The sail area is generous – only in calm, the oars are needed. The long and low sailplane is perfect for maneuvering – sail backward, sideways, turning or tie the rudder and steer with the mizzen sheet – and the boat stays balanced when reefed. You can make progress – wet, slow and tiring but not scary – against a 30-knot wind with staysail and mizzen if caught out in bad weather. There is room for four people in the cockpit, but there are photographs of the prototype sailing happily with 12 kids aged 6-12. On overnight trips, two can sleep on the cockpit floor under a boom tent. The boat is reasonably easily built – a winter project for a determined amateur builder. The prototype was built over 6 months during the winter of 1989-1990 for approx. SEK 5500 (~ €620 or $820), working during spare time from a full-time job (note that this was over 25 years ago, and the prices are radically different now). The building method is wood strip on temporary particle board molds, similar to the method for building kayaks and canoes – with thicker strips and heavier fiberglass cloth. The deck, bulkheads, and floors are plywood. The masts, booms and sprits are fir or spruce, with the masts and sprits hollow – one way of building these is described in the plans. All hardware was cut from standard iron sections, welded with a tiny AC stick welder and hot-dip galvanized. The sails were cut on the living room floor and sewn with a household sewing machine. Photos of Inge Alméns "BlåKråka" (the name meaning European Roller): the finished boat and some details.Photos of Inge Alméns "BlåKråka" (the name meaning European Roller): the finished boat and some details. Photos of Mikael Möller' "Scarlet", and many instructive and inspiring photos from the building project. A film from the building of Per-Ivar Corins Canoe. A Canoe Yawl in progress by Povl Eskild. Also from Povl, a short video from sailing across Struer Bugt: 3-5 m/s wind and 4,5-5,3 knots on the wind! More sailing: Johan Lindblom and Inge Almén off Arkösund on the Swedish east coast. Four sheets contain the information needed to build the canoe yawl. Most are in metric scale 1:10, with some details full-size. The data for drawing the station molds is contained in a simple Table of Offsets. From the rig and sails data, you can make your own rig and sails – or give the jobs to your rigger/sailmaker. The plans include details for welding all the custom hardware (to be galvanized after fabrication) if you want to keep the craft simple and workmanlike. A more elegant alternative would be to make patterns and have the needed hardware cast in bronze – or of course, buy ready-mades in stainless and plastic. If someone wants to put sailmarks on the sails of their Sharpie, here are a couple of suggestions. They are available as downloads on the download page. The color can be adjusted to suit the color scheme of the hull. During the winter of 1989-1990, I built the prototype for the Canoe Yawl in the garage on Skånevägen in Lund. The project took half a year working evenings and weekends. Everything was made at home: the hardware welded from standard iron profiles, the lead weight for the centerboard cast from scrap car tire weights which were melted (outdoors and windward from the pot!) on a kerosene stove, and the sails sewn on an ordinary household sewing machine. The finished hull with floors, bulkheads etc. The turned hull epoxy primed prior finishing. The bottom has a coat of white primer. A photo from the bedroom window with some early spring apple twigs in the way. Most of the deck beams and the centerboard trunk are in place. Tha sails were lofted, cut and taped on the living-room floor. One of my daughters worked the sewing machine. The luff and head ropes and the clew, throat, tack, head and reef cringles were sewn in by hand. Wheeled out on the driveway for a photo session. "Test sail" with the finished rigging and sails. The strongback had wheels (lawn mower wheels) and handlebars from the start, so I could do most of the sanding outdoors – weather permitting. The winter of 1989-1990 was the coldest in decades, with long periods in late January and February below -20ºC (-5F). In an unheated garage working with epoxy was a challenge. Not much was left untried: old army blankets, electric infrared radiant heaters, candles in coffee tins, electric fan heaters, a couple of camping stoves and an ancient two-burner kerosene stove (the same that melted the lead for the centerboard weight) were all put to work at some time! Kids sailing in Haverdal on the Swedish west coast. A temporary staysail, quickly made from a discarded optimist dinghy sail was a temporary replacement for the original foresail that was stolen or (perhaps more likely) blew away during an overnight gale. Anchored for lunch – sails left up to lose as little time as possible. Sailing for days on end - in almost any weather. The canoe yawl was a common type of boat in Britain at the end of the 19th century. 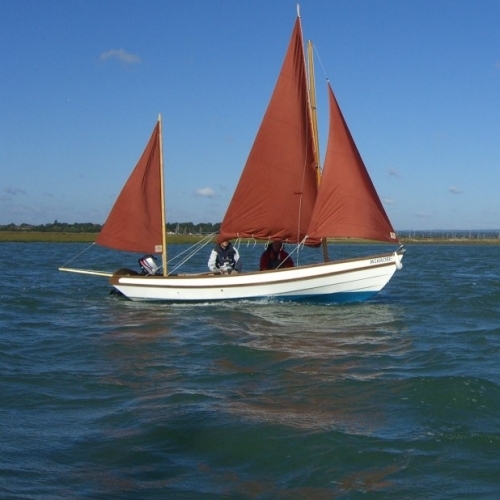 A canoe yawl was defined in those years as a small double-ender with two masts with the sail on the aft one by far the smallest, built lightly to be carried by two persons once the ballast was removed. Furthermore, it could be sailed in very shallow waters and was able to cope with quite rough seas. The smallest were meant to be paddled in a calm; the larger ones were rowed. They were used for competitions and for touring the inner waterways and protected archipelagoes. They were limited in size, to allow transportation by railway for a reasonable fee. "Ethel", the inspiration for my Canoe Yawl, was designed 1888 by George Holmes for the Humber Yawl Club in England and was built by J. A. Akester, a well-known local builder. Holmes' original drawing for "Ethel", from Dixon Kemp´s 1895 "Manual of Yacht and Boat Sailing". George Holmes' cover illustration for the Humber Yawl Club's yearbook 1904, depicted a Canoe Yawl in suitable surroundings – probably not "Ethel", but something. My contributions have been small changes in the rig and hull shape, but otherwise, I have stayed close to George Holmes' original design. The rig was originally a dipping lug, which I changed for a standing lug and added a foresail. The dipping lug is a slightly more efficient rig, but have the disadvantage that you have to lower the sail when tacking and hoist it again on the new lee side (on a boat this small it may be sufficient to lift the boom to the other side and tug the luff exactly when passing through the wind). I chose to sacrifice a little efficiency for the convenience of a self-tacking mainsail. With the standing lug mainsail, I could add a small staysail on a bowsprit, which probably more than compensates for the lost efficiency of the dipping lug. Furthermore, since experience has taught us that volume in the ends means more speed, I modernized the hull with a little more volume aft than was customary in Holmes' days. I also wanted more load carrying capacity aft, guessing that my canoe yawl often will have two or three persons in the cockpit. In Holmes' days, the usual crew was one young nobleman, eager to master canoe sailing as a pastime. I also designed a lifting rudder, for sailing in shallows and beaching.